Netbook alternative? 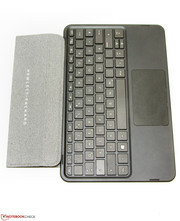 HP includes a dockable keyboard for its Pavilion so that it can be used for more than just a media and browsing station. An economic quad-core processor provides the necessary computing power, and the battery life is also decent. HP demands about 250 Euros (~$309) for the device. 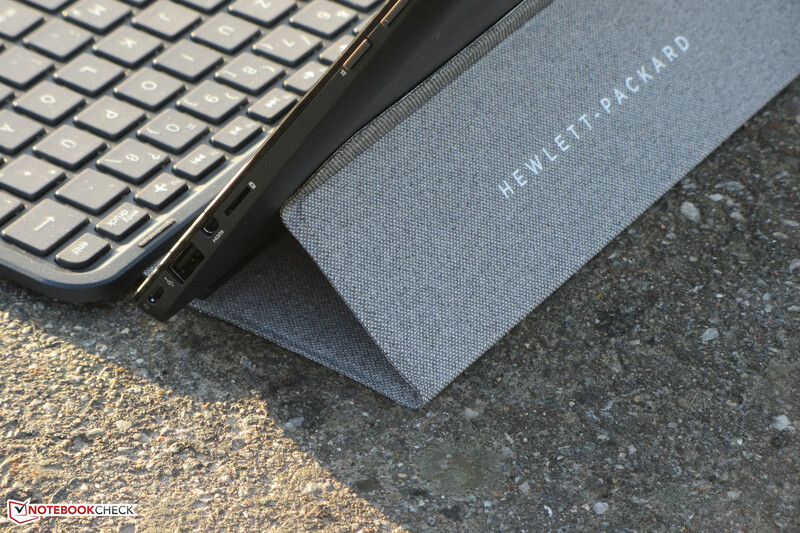 Hewlett Packard describes its little Pavilion 10-k000ng as a "detachable PC," although it is basically a tablet with a dockable keyboard. 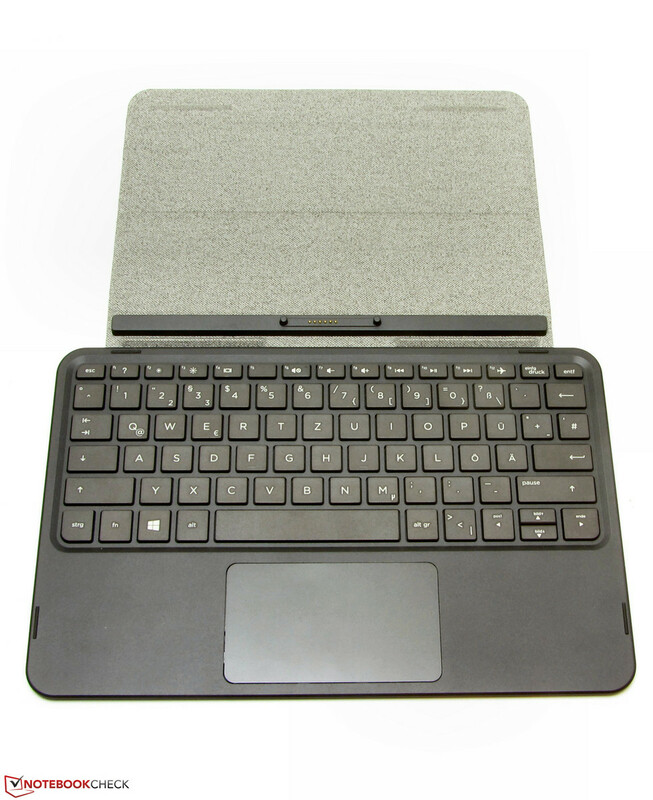 On the one hand, the company aims at users who simply want to own a tablet but do not want to waive a physical keyboard and, on the other hand, at netbook / subnotebook users. 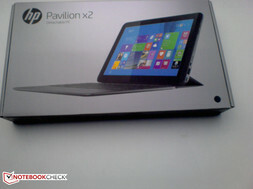 Our report uncovers whether the Pavilion is compelling, and whether it can replace a netbook or subnotebook. 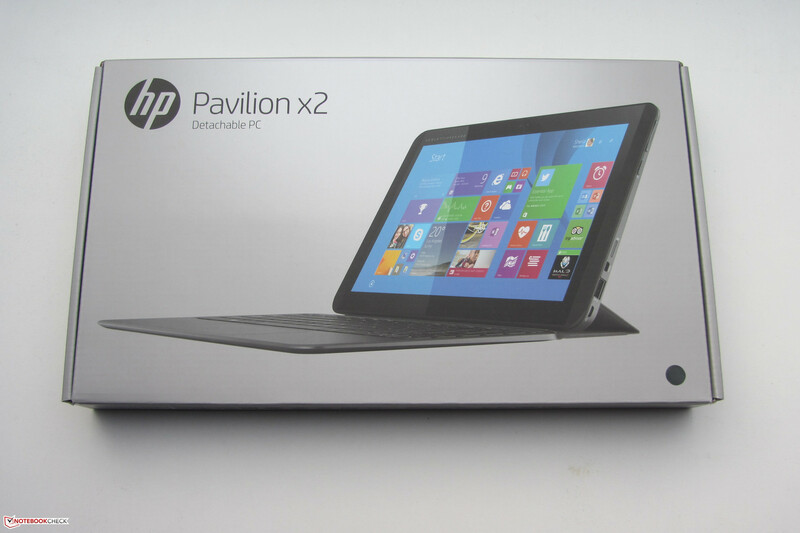 HP is not the first maker to launch a device like the Pavilion in the market. 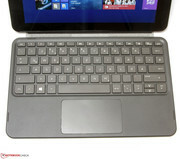 Some contenders are Acer's Aspire Switch 10, Asus' Transformer Book T100TA, Schenker's Element, and Wortmann's Terra Pad 1060. 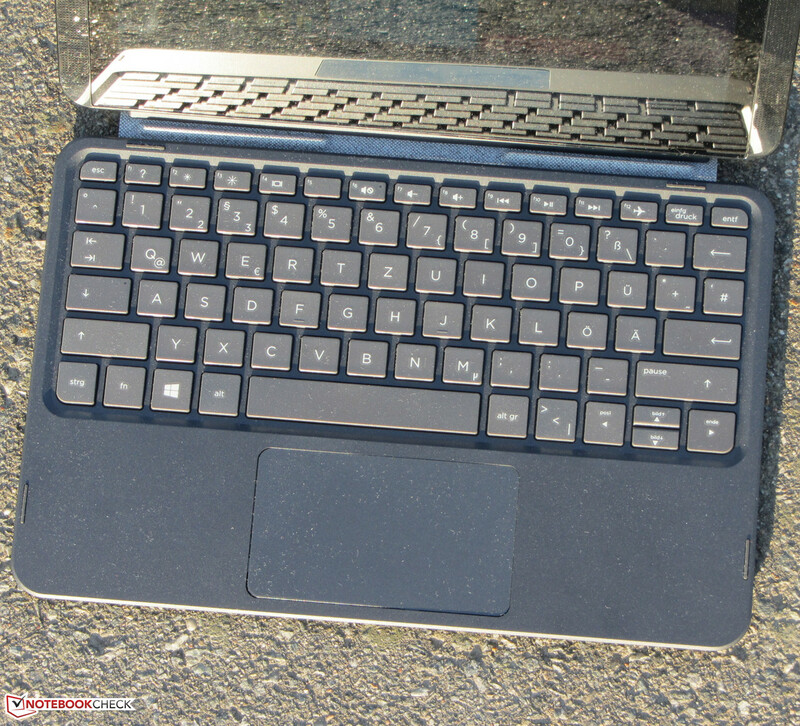 However, competition is also found among 10.1 to 11.6-inch netbooks and subnotebooks. Examples would be Asus' F102BA, Acer's Aspire V3-111P, and Lenovo's ThinkPad Edge E145. The tablet is made completely of plastic. The back is clad in matte, dark gray. HP calls this color "Ash Silver." 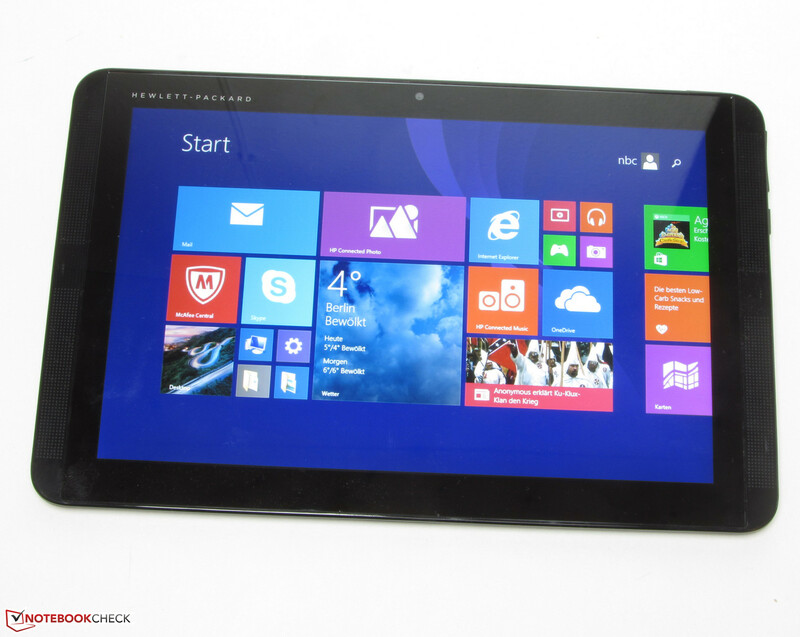 The tablet's front is kept in a glossy black. The Pavilion has a weight of approximately 590 grams and a thickness of 9.6 mm. For comparison, Apple's iPad Air 2 (437 grams, 6.1 mm) and Samsung's Galaxy S 10.1 (470 grams, 6.6 mm) clearly undercut these rates, but they are also about 150 Euros (~$185) more expensive than the Pavilion. 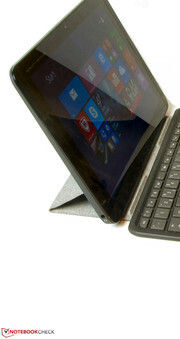 HP's tablet weighs 920 grams and has a height of 16.9 mm when docked to the keyboard. The tablet is intended for use in landscape mode. A roughly one centimeter wide, perforated cover flanks both sides of the screen. They hide the speakers located exactly in their middle. The device's build is satisfactory. The tablet could be more rigid; we could twist it far too easily for our taste. 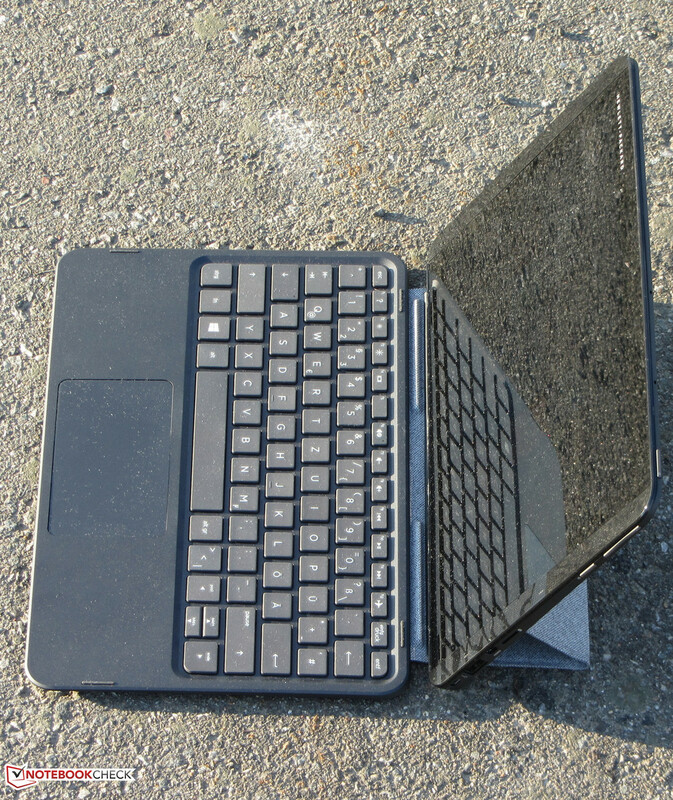 There is no extra maintenance cover, but the tablet's back could be removed with a flat, plastic spatula. However, there is no reason for opening the device since neither the working memory nor the hard drive can be replaced / upgraded. After all, there is always the risk of damage. The included keyboard serves as a stand. Two angles are possible: 120 degrees and 135 degrees. A magnet keeps the stand in position. 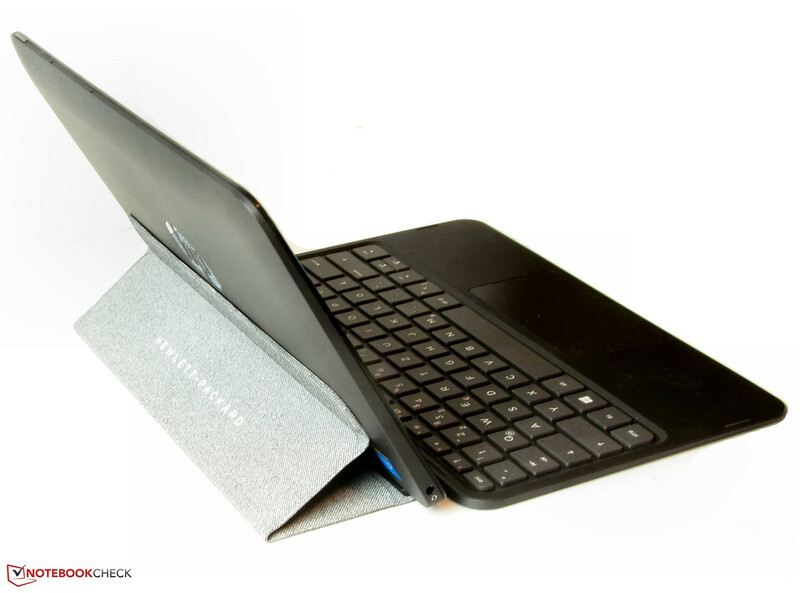 The stand turns into a cover that partly covers the tablet's back when closed. The Pavilion docked to the keyboard. A magnet keeps the stand in position. The stand is simply folded after use. There are no surprises when it comes to interfaces. 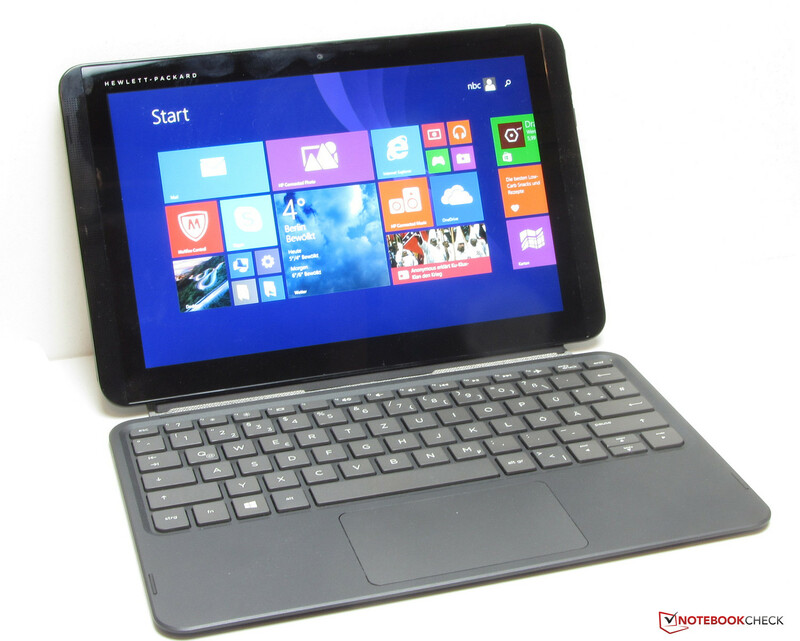 It offers the same ports as found in Acer's Aspire Switch 10 and Asus' Transformer Book T100TA-C1-GR. There is one minor difference though. 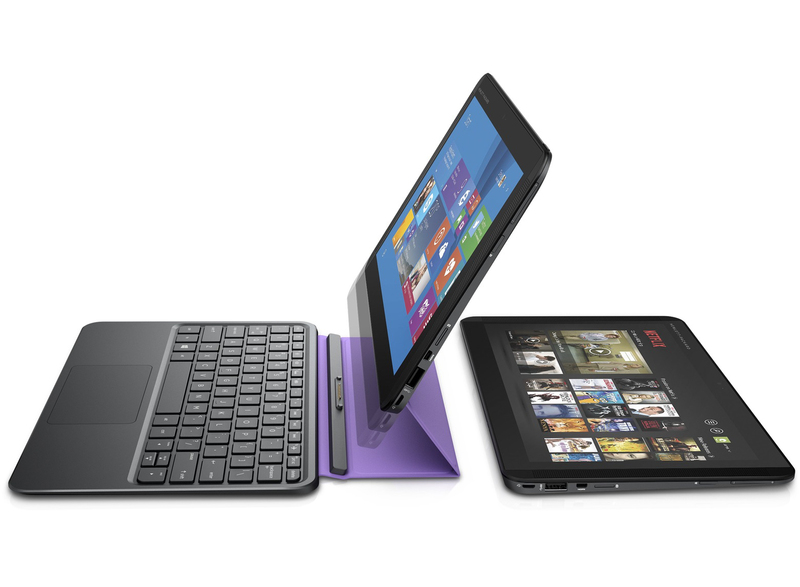 While the Aspire and Transformer Book both feature a micro-USB port, the Pavilion sports a full-sized USB 2.0 port. Thus, an adapter is not needed for connecting a mouse or USB stick. Only external storage devices with a dedicated power supply can be used. 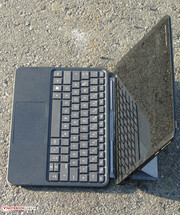 The keyboard docks of both the Aspire and Transformer have a USB port, unlike the Pavilion's keyboard that does not have any additional interfaces. Like both Acer's Aspire Switch 10 and Asus' Transformer Book T100TA-C1-GR, the 32-bit version of Windows 8.1 in the Bing edition runs on the Pavilion. Consequently, only 32-bit applications can be used, which is no problem since virtually every common application is also available in a 32-bit version. The Atom processor in the Pavilion is 64-bit capable, but manufacturers install the 32-bit version because it is easier on resources. The Pavilion sports RealTek's RTL8723BS Wi-Fi chip that supports the 802.11 b/g/n standards. We did not encounter any connection issues. The connection was stable within a radius of 15 meters around the router. A Bluetooth 4.0 module is also available, but HP does not install a GPS module. The Pavilion is only equipped with a webcam. Its maximum resolution is 1280x960 pixels, and thus artistic masterpieces should not be expected. The quality is sufficient for videoconferencing. The device is only shipped with the keyboard dock. 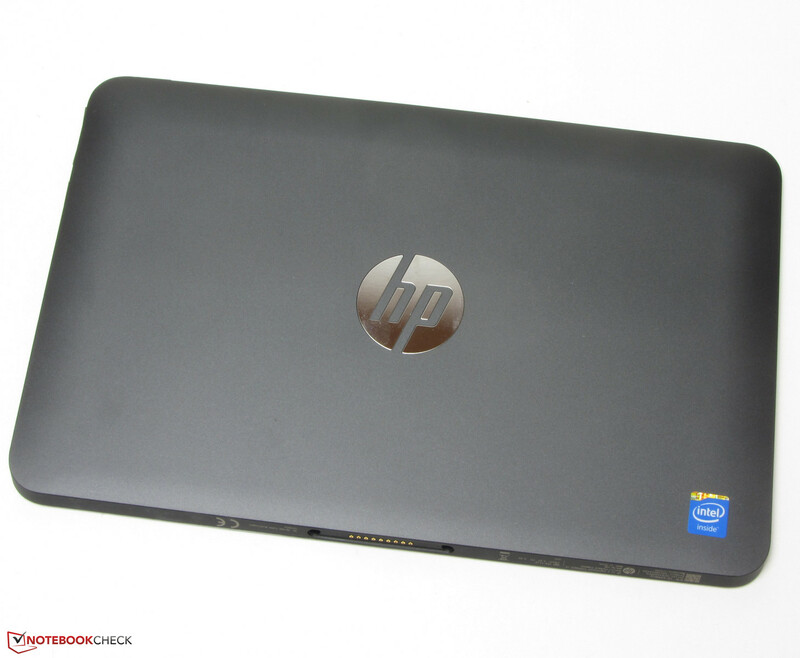 HP does not offer any optionally purchasable product-specific accessories either. However, the Pavilion features a software treat: A one-year license for Office 365 Personal is in the device's box. The key allows using Office on a PC and tablet. Additionally, the tablet buyer gets 25 GB of storage from the cloud service "Box." The Pavilion is shipped with a one-year warranty including a pick-up service. Both Acer's Aspire Switch 10 and Asus' Transformer Book T100TA-C1-GR also only come with a twelve-month warranty. The Pavilion's warranty period can be upgraded; a three-year warranty costs approximately 74 Euros (~$91). 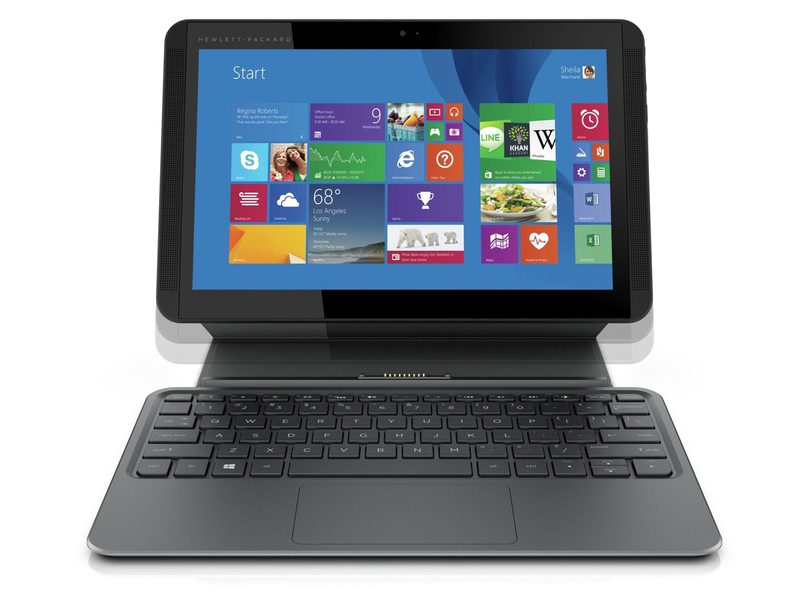 The tablet's touchscreen implements inputs directly and without problems. Users who prefer using a mouse cursor and keyboard can do so. The keyboard dock does not have a backlight. 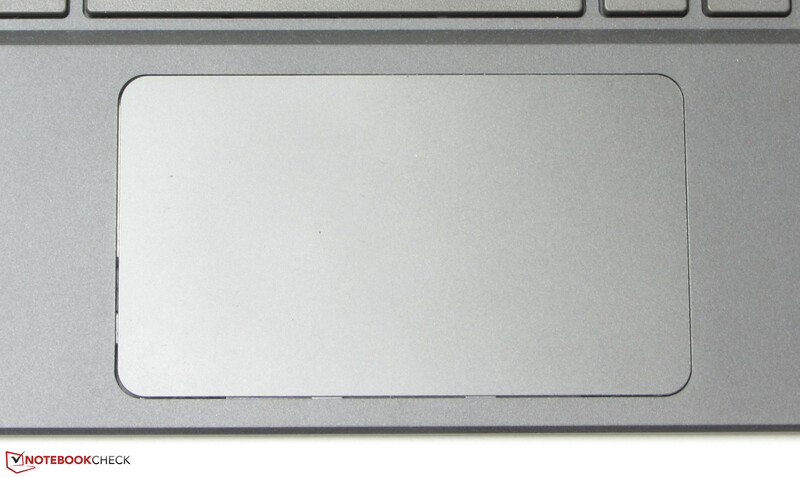 The level, roughened keys feature a short drop, but the pressure point could be clearer. The keyboard yields when typing on it, which adversely affects the typing feel in conjunction with the somewhat indistinct pressure point. The keys are a bit too small and too tightly spaced for averagely-sized masculine hands. Overall, the keyboard is not really suitable for regular typing tasks. Users looking for a portable typewriter should stick to 11.6-inch laptops, such as Lenovo's ThinkPad Edge E145 that features a very good keyboard. 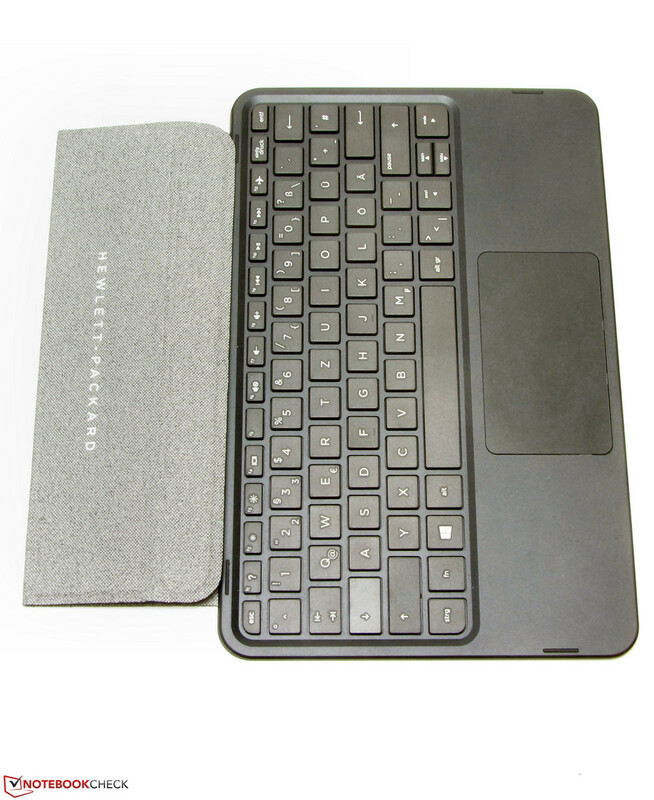 The keyboard dock includes a multi-touch ClickPad with a surface area of approximately 9.3 x 5.4 cm. 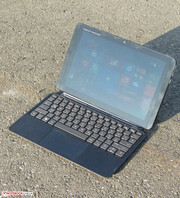 The sleek surface does not thwart the fingers from gliding, and gesture controls can be implemented without problems. The pad features a short drop and clear pressure point. 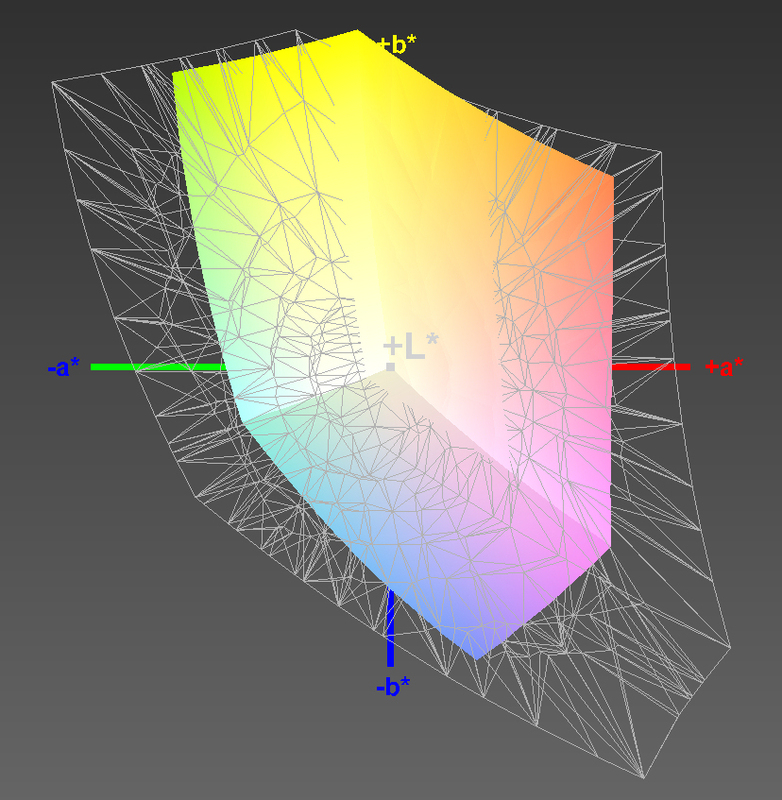 The diagonal of the Pavilion's screen is 10.1-inches with a native resolution of 1280x720 pixels. The rate is a bit disappointing when considering that the only 30-Euro (~$37) more expensive Acer Aspire Switch 10 sports a WUXGA screen (1920x1200 pixels). The Pavilion's screen achieves a good brightness of 302 cd/m². However, the Aspire (407.1 cd/m²) can boast with a better rate again in this case. 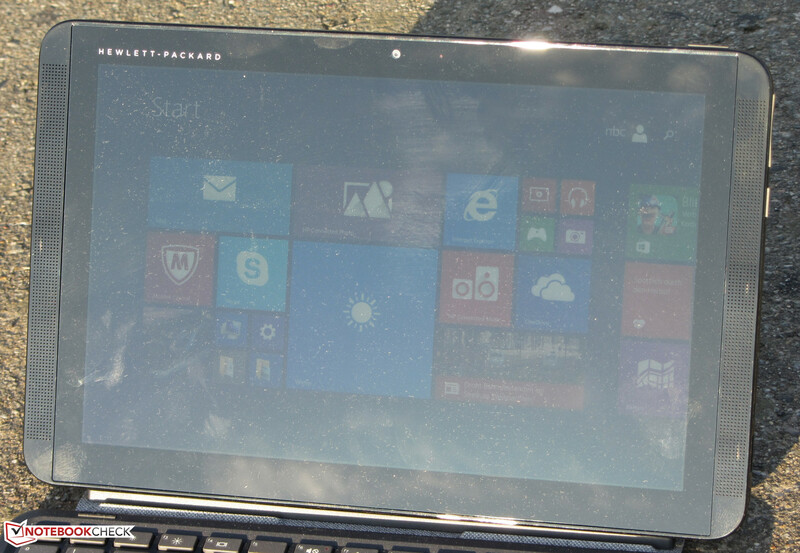 HP has to accept criticism for the screen's clouding. The halos are very evident in black content. We really liked the contrast of 1219:1 and black level of 0.27 cd/m². Asus' Transformer Book T100TA-C1-GR (1033:1; 0.24 cd/m²) reaches similar rates. Acer's Aspire Switch 10 (777:1; 0.56 cd/m²) lags behind its contenders. However, the rates can still be called good. The Pavilion's screen cannot reproduce either the sRGB or AdobeRGB color spaces. The coverage rates are 41% (AdobeRGB) and 58% (sRGB). Not only are the contrast and black level compelling, but the color reproduction is too. The screen only slightly misses the DeltaE 2000 target range (DeltaE less than 3) with a shift of 3.93. The screen does not exhibit a bluish cast. The device can be used outdoors to a limited extent owing to the screen's good brightness and contrast rates. However, the reflective surface thwarts any such plans in bright sunlight. 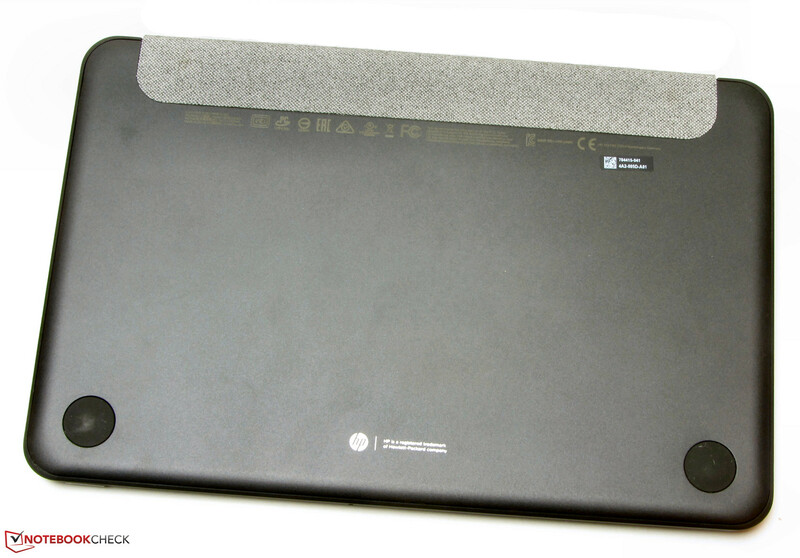 HP's website does not specify the screen type. 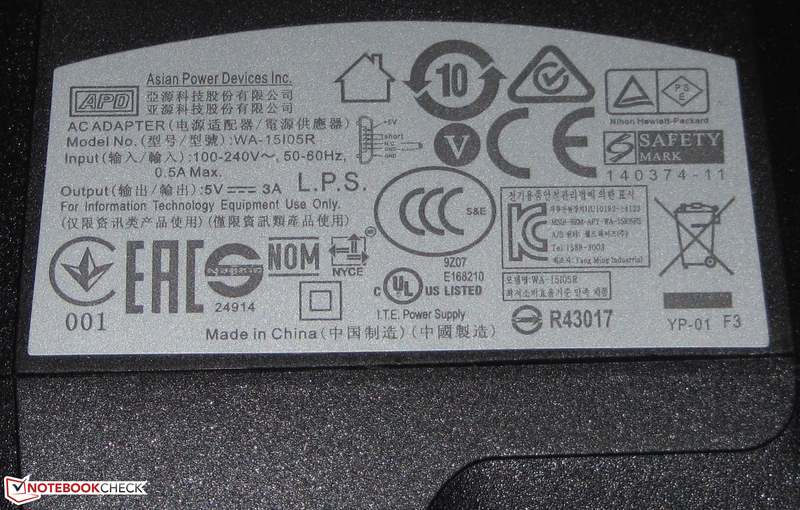 However, the viewing angles indicate that it is likely an IPS model. 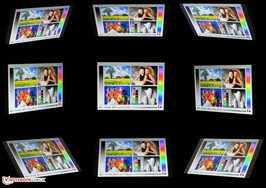 The screen can be read from every position. The Pavilion outdoors (shot in direct sunlight). HP's Pavilion 10-k000ng is a 10.1-inch tablet with a dockable keyboard. 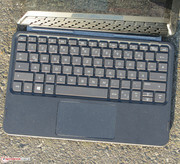 The laptop's computing power is sufficient for applications from the office and Internet fields. Our review sample is available for approximately 320 Euros (~$395). Another version dubbed Pavilion 10-k001ng was available at test time. It only differs in the stand's color (purple). 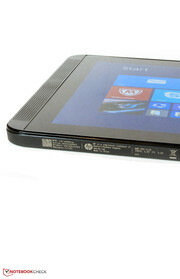 An Intel Atom Z3736F quad-core processor is inside the little tablet. The CPU operates with a base speed of 1.33 GHz, which can be boosted to 2.16 GHz via Turbo that is rarely maxed out. 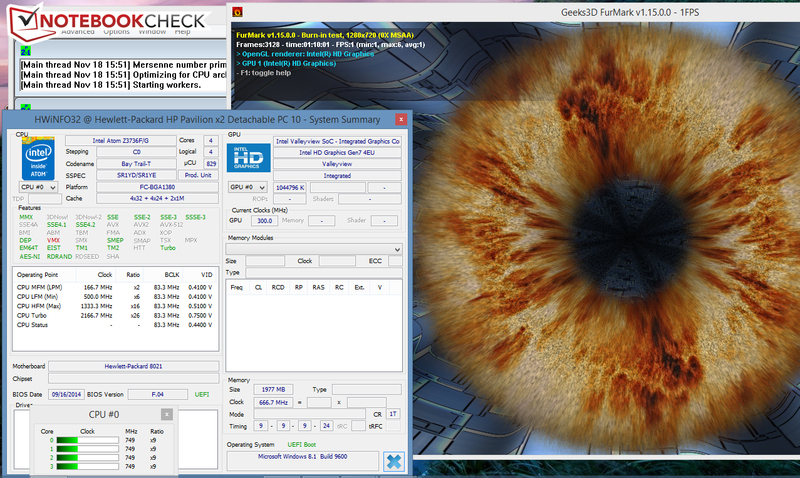 The processor's TDP is below 4 watts. The processor performed the single-thread tests of the Cinebench benchmarks with 1.6 to 2.16 GHz in AC mode. The multi-thread tests were performed with 1.6 GHz. All tests ran with 1.6 GHz on battery power. In terms of performance, the processor is between the models installed in Acer's Aspire Switch 10 and Asus' Transformer Book T100TA. 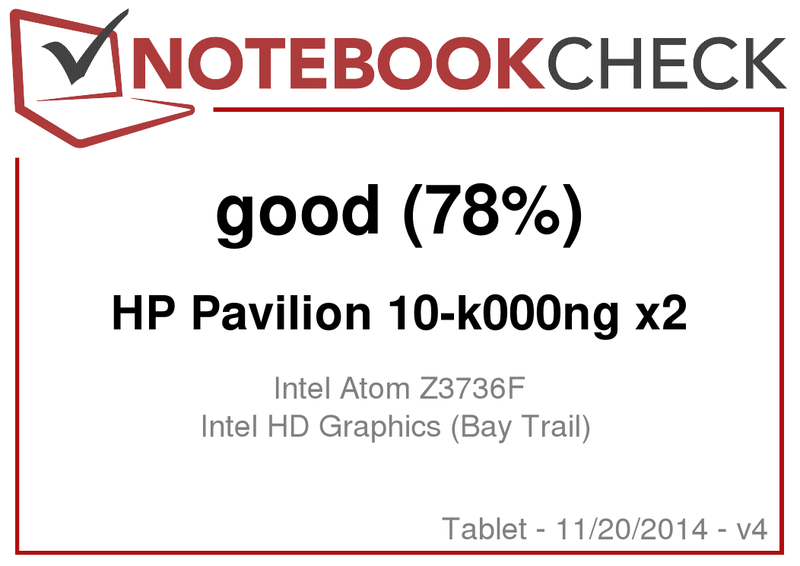 The Atom Z3740 in the Transformer Book delivers the best scores in total. The tablet ran smoothly and we did not encounter problems. 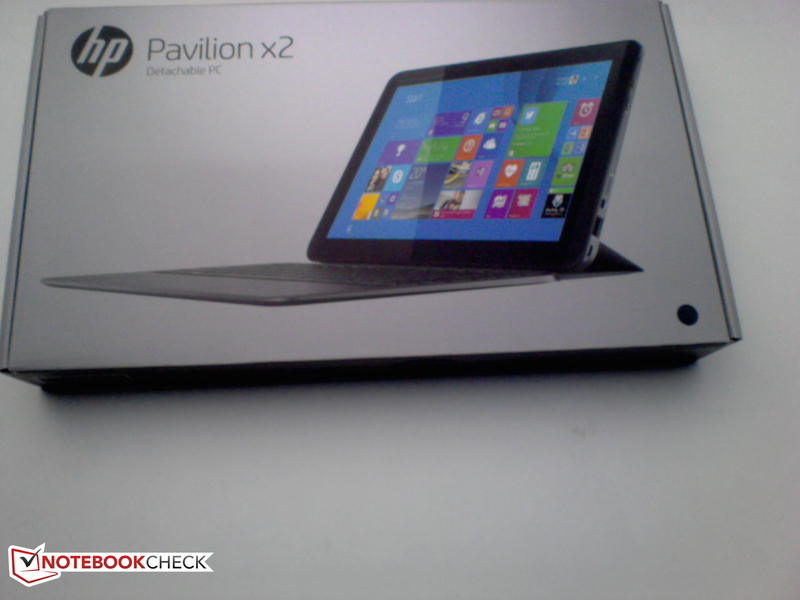 The PCMark scores were as expected and are on par with comparable devices. The scores are at the lower end of the performance scale. An eMMC storage device with a capacity of 32 GB is installed in the Pavilion. Roughly 10 GB of that is reserved for the recovery partition. The storage device offers overall good transfer rates. The eMMC storage installed in contenders, such as Acer's Aspire Switch 10 and Schenker's Element 3G, are considerably swifter though. However, none of the devices can compete with Wortmann's Terra Pad 1060. Wortmann relies on a real SSD that operates much faster than eMMC storage devices. Thus, the Terra Pad makes an overall swifter and sprier impression although it has a considerably weaker processor than the three named contenders. The tablet sports Intel's HD Graphics core. The GPU supports DirectX 11 and operates with speeds of up to 646 MHz. The 3DMark benchmark scores are on par with comparable computers. Overall, the results are at the lower end of the chart. A comparable AMD GPU, such as the Radeon R3 (Mullins/Beema) graphics core, has considerably more computing power. Games from the Windows Store will usually run smoothly on the tablet. 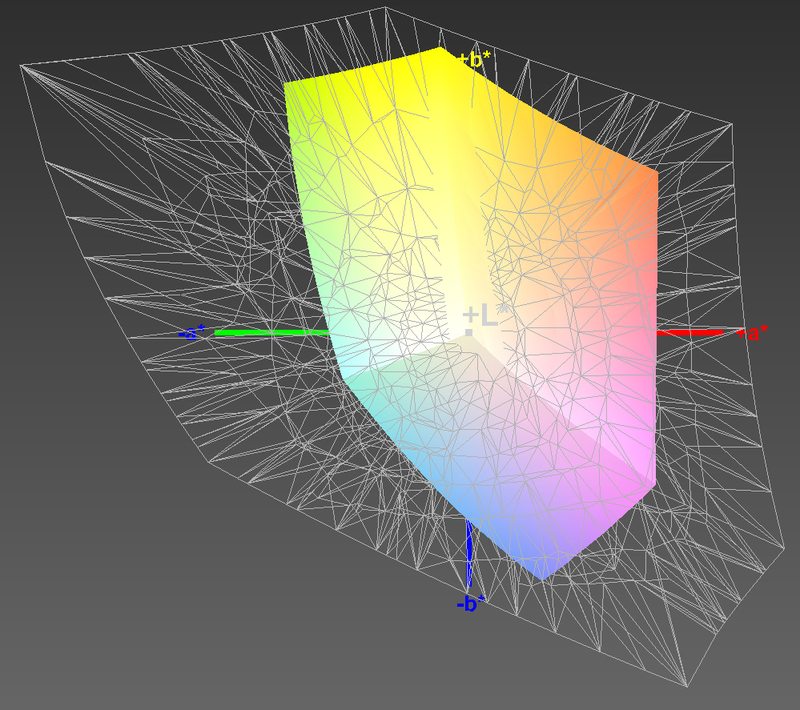 Modern 3D games do not achieve playable frame rates on the device - with a few exceptions - disregarding the fact that the available storage capacity will only be enough for very few games. The tablet performed the stress test (Prime95 and Furmark run for at least one hour) in both AC and battery modes in the same manner. The CPU started the stress test with 1.5 GHz, but it dropped in the course of the test. After about 20 to 30 minutes, the speed settled to 600 to 750 MHz where it stayed for the remaining time. The graphics core operated with 300 MHz. We recorded temperatures of over 40 °C in some areas during the stress test. That is, however, not surprising since the tablet does not have a fan that cools the device. The device barely heats up during normal use. The load temperatures of Acer's Aspire Switch 10 and Asus' Transformer Book T100TA-C1-GR are only marginally lower than the Pavilion's. (±) The maximum temperature on the upper side is 43.1 °C / 110 F, compared to the average of 34.8 °C / 95 F, ranging from 22.2 to 51.8 °C for the class Tablet. The Pavilion's stereo speakers are located on the screen's left and right behind a perforated cover. They produce a thin sound that lacks bass. The speakers do not belong to the loudest models among tablet speakers. A better sound can be achieved with headphones or external speakers. The Pavilion's load power consumption does not reveal any surprises. It is on par with contenders like Acer's Aspire Switch 10 and Asus' Transformer Book T100TA-C1-GR with an energy requirement of approximately 10 watts. Furthermore, all devices struggle with throttling in full load. However, the Pavilion is a bit more guzzling than its rivals in idle mode. 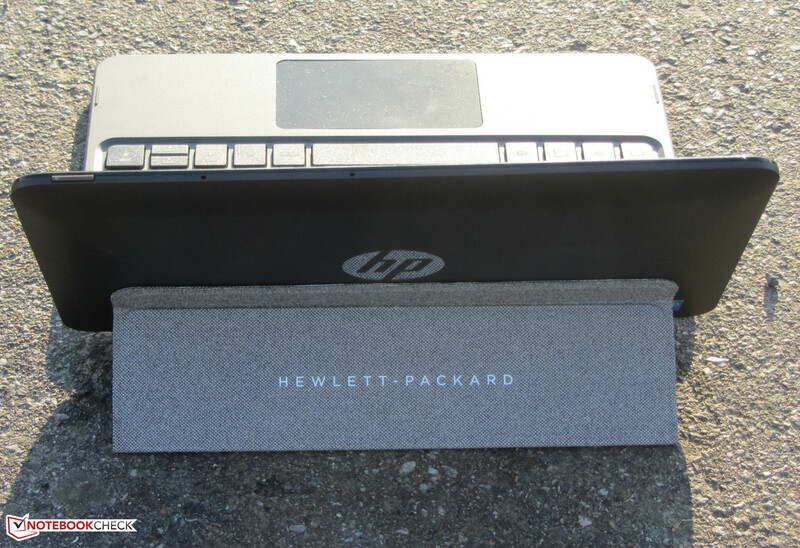 HP promises a runtime of up to 11 hours. We can confirm that. The Pavilion's battery even lasted for 12:35 hours when idling. 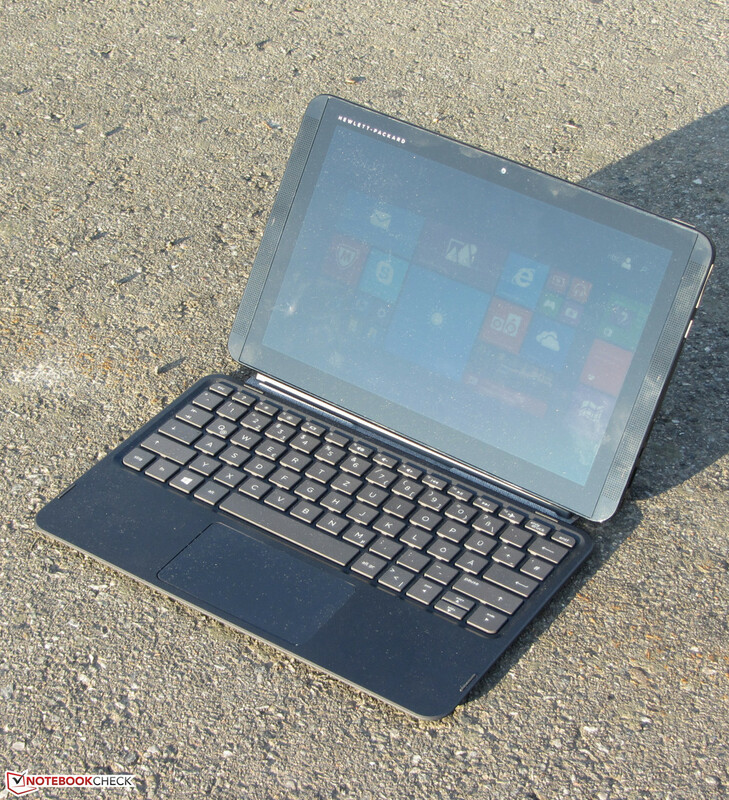 However, the Transformer Book T100TA (16:39 h) easily outperforms that. Idle mode is ascertained using Battery Eater's Reader's test. The screen is set to minimum brightness, and the wireless modules are disabled. The Pavilion shut down after 4:04 hours of load and is thus on par with the Transformer Book (4:16 h). Battery Eater's Classic test is used to determine the load runtime. Here, maximum screen brightness and enabled radio modules are used. 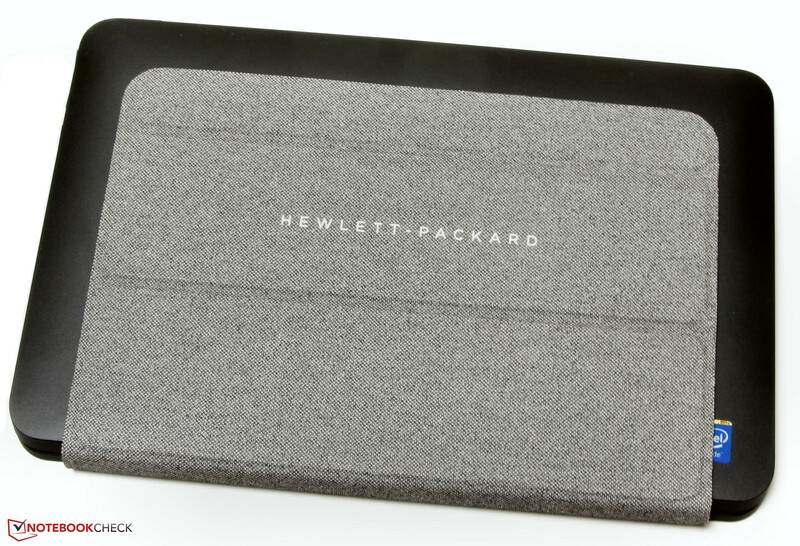 HP's tablet ran for 7:48 hours in the practical Wi-Fi test. Acer's Aspire Switch 10 (7:33 h) lags behind by only a few minutes. Again, the Transformer Book (10:47 h) takes the lead. In this test, websites are opened automatically every 40 seconds, and the screen's brightness is set to approximately 150 cd/m². We check the video playback time by running the short movie Big Buck Bunny (H.254 encoding, 1920x1080 pixels) in a loop. The wireless modules are disabled, and the screen's brightness is set to roughly 150 cd/m². The Pavilion 10 lasted for 7:51 hours. We did not perform this test on the contenders. Note: The Pavilion only offers the energy profile "Balanced." Thus, we performed all tests using this profile. HP's Pavilion 10-k000ng is a basic 10.1-inch tablet with a dockable keyboard. The computer provides enough power for applications from the office and Internet fields. The viewing-angle stable screen offers a good brightness and a very good contrast. The price level of 320 Euros (~$395) also makes it interesting for pupils and students. One battery charge is quite enough for a day at school or university. However, the keyboard is not really suitable for prolific writers. 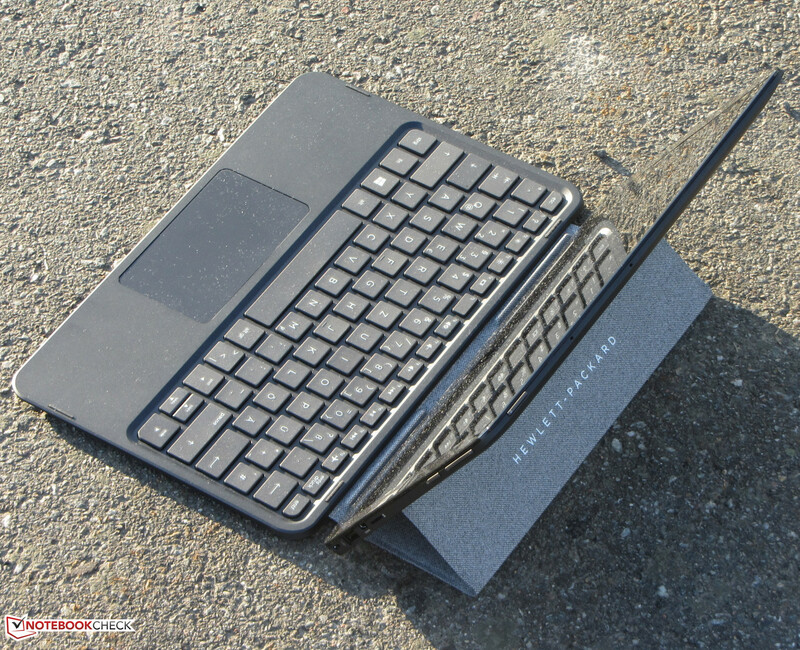 Buyers looking for a compact, portable typewriter should still prefer netbooks / subnotebooks in our opinion. Models with recommendable keyboards would, for example, be Acer's Aspire V3-111 and Lenovo's ThinkPad Edge E145 11.6-inch laptops. The high-resolution and very bright WUXGA screen (1920x1200 pixels) makes Acer's Aspire Switch 10 SW5-012-13DP recommendable. 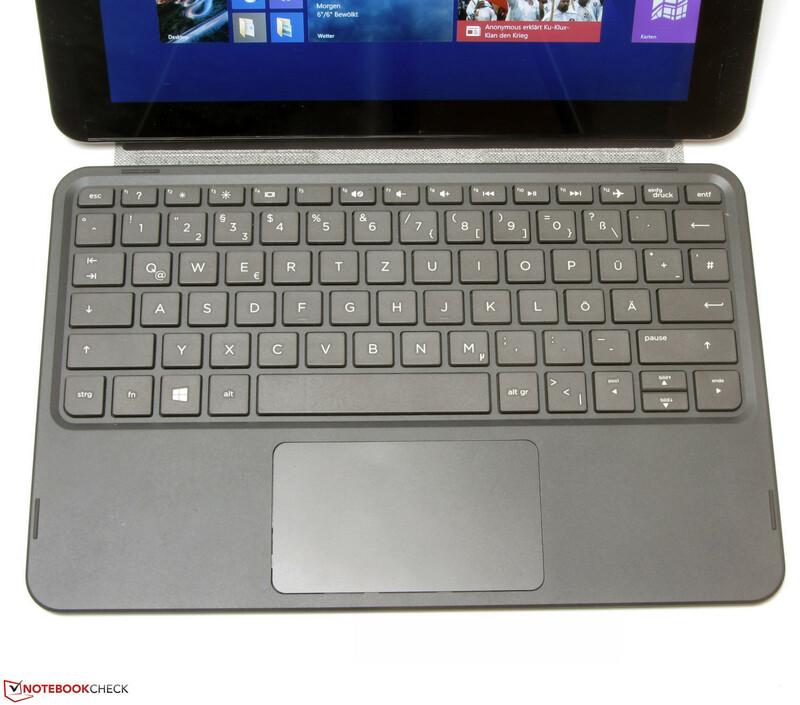 Asus' Transformer Book T100TA-C1-GR offers the best battery life of our comparison devices. 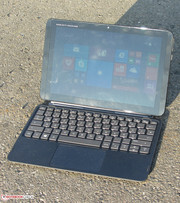 Buyers looking for a Windows tablet including mobile Internet access should look at Schenker's Element or Wortmann's Terra Pad 1060. Both devices are optionally available with a 3G modem. A "Volk's Tablet" from Trekstor was launched as another alternative during our test. The tablet with a 3G modem is sold for 250 Euros, ~$309 (200 Euros, ~$247, w/o 3G modem). Its configuration is virtually identical to that of the Pavilion. Only the processor (Atom Z3735F) has a slightly lower Turbo speed. When the price for the keyboard dock is added to that (approx. 50 Euros, ~$61), the device is almost a bargain. The screen's diameter is 10.1-inches. 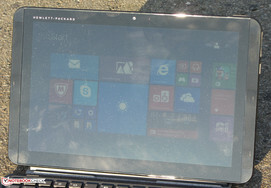 The display's back features a matte surface. The speaker's are beside the screen. The power supply has a weight of 137 grams. It has a power output of 15 watts. The device is also available with a purple stand. 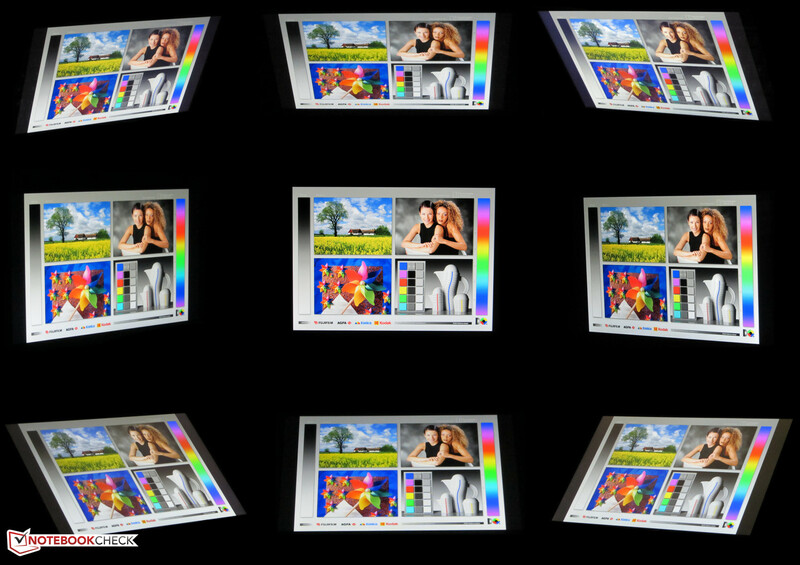 The bright, high-contrast, viewing-angle stable screen. A better keyboard. A 3G/LTE modem would also look good in the device. 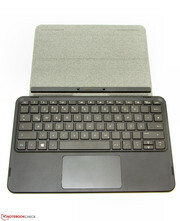 Acer Aspire Switch 10 SW5-012-13DP (tablet), Asus Transformer Book T100TA-C1-GR (tablet), Schenker Element (tablet), Wortmann Terra Pad 10 (tablet), Asus F102BA (10.1-inch netbook), Medion Akoya E1317T (10.1-inch netbook), Acer Aspire V3-111P (11.6-inch netbook), Lenovo ThinkPad Edge E145 (11.6-inch subnotebook), Lenovo S20-30 (11.6-inch netbook), Acer Aspire E3-111 (11.6-inch netbook).